Good size and case construction. Comfortable fit on the wrist with a legible and proportionate dial. Comparatively weaker in terms of movement and brand value against competitor offerings. Difficult to find a significant unique selling proposition for the watch unless one is a fan of the French Coast Guard. Bell & Ross extends its product line with the vintage inspired V2-94 Garde-Côtes. 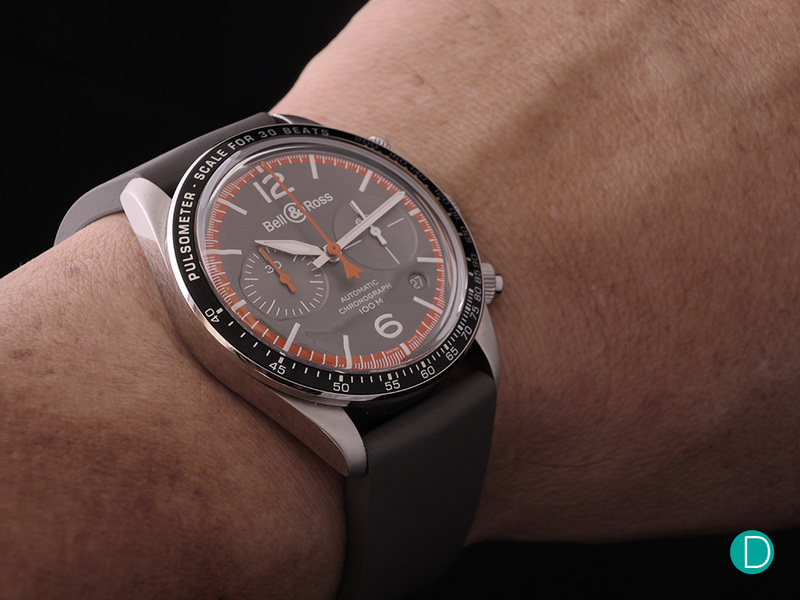 The Garde-Côtes model is a tribute to France’s coastguards and uses their colour theme of grey, orange and white. 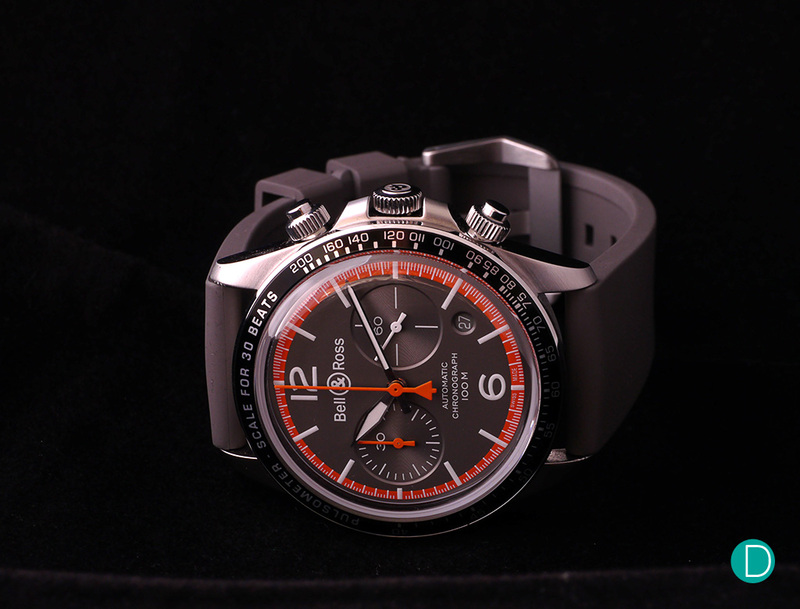 The tribute models are available in both a time-only 3 hands V2-92 and a chronograph V2-94. 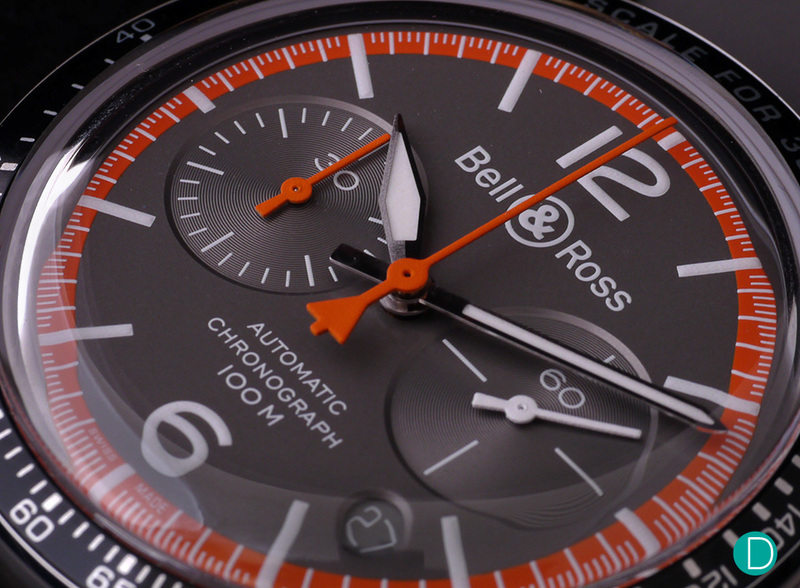 The Bell & Ross V2-94 Garde-Côtes with the signature grey, white and orange colour theme as a tribute to the French Coast Guard. Note the distortion on the side of the crystal due to its ultra curved nature. We performed a Scanning Acoustic Microscope image scan of the crystal. See here for the discussion. The V2-94 Garde-Côtes uses a reduced case size of 41 mm, down from 43 mm in previous Bell & Ross vintage chronographs. The case shape is round and arguably sleeker, with a thinner profile, discounting the raised dome sapphire crystal. The watch is cased in satin finished stainless steel and measures 41 mm in diameter. 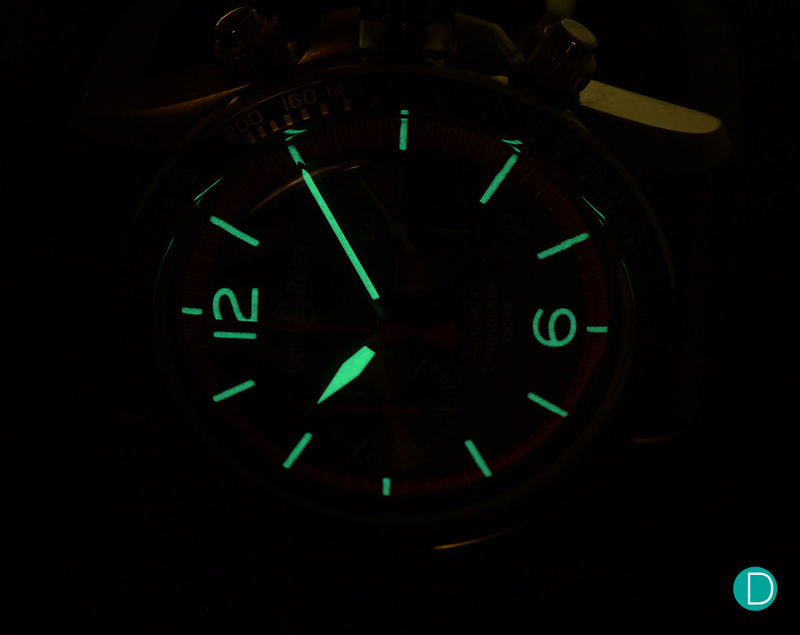 In the dark, the superluminova applied to the hour indicators and the hour and minutes hands light up the dial. The satin-polished steel case uses the common 3 piece construction with a sapphire see-through case back. It uses a steel bezel fit with an anodised black aluminium insert. 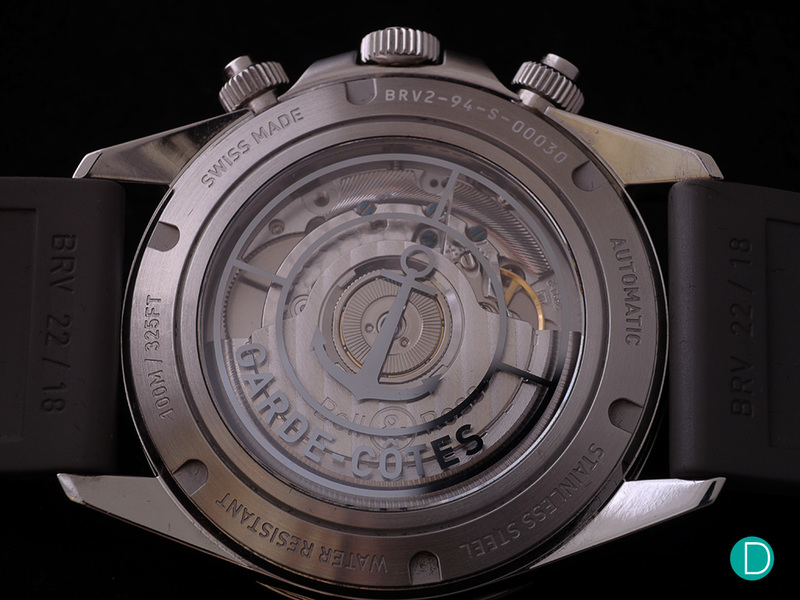 Unique to the Garde-Côtes edition, the bezel insert displays a pulsation scale, instead of a tachymeter seen on the regular black dial and Belly Tanker edition. For a vintage flair, the watch uses an ultra-curved sapphire crystal that resembles the plexi-crystal of the past but with modern technology like anti-reflective coating for better dial clarity. A pulsometer is used on the Garde-Côtes, instead of a tachymeter seen on the other editions. The profile of the watch is rather slim at about 12 mm, as opposed to chronographs with the 7750 movement. Features like screwed-down crown and pushers help improve water resistance. The dial has a unique slate grey color and is accompanied by white hands and indexes that enhances legibility. 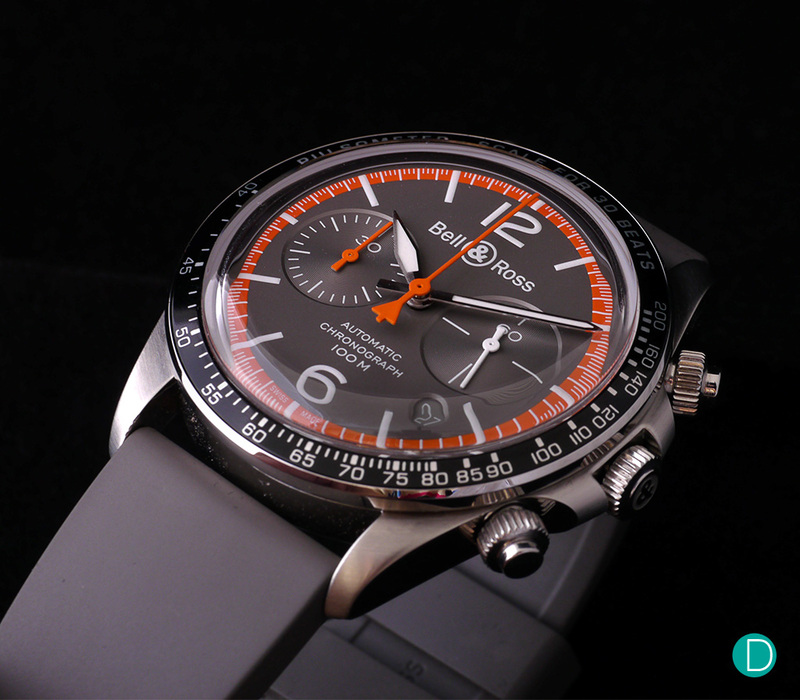 On its periphery lies an orange minute track that matches with the chronograph hand and the minutes counter hand. The case design is as congruent to its Coast Guard relation as it is functional. Pushers are equipped with a screw guard and the crown, a screw down mechanism. These features enhance the water resistance of the timepiece to 100m. A see through case-back reveals the BR-CAL.301 self-winding movement. The Bell & Ross V2-94 Garde-Côtes uses the calibre BR-CAL.301. A self-winding movement that is otherwise known as an ETA 2894-2. The same movement is used in the Tudor Heritage Chrono Bleu. 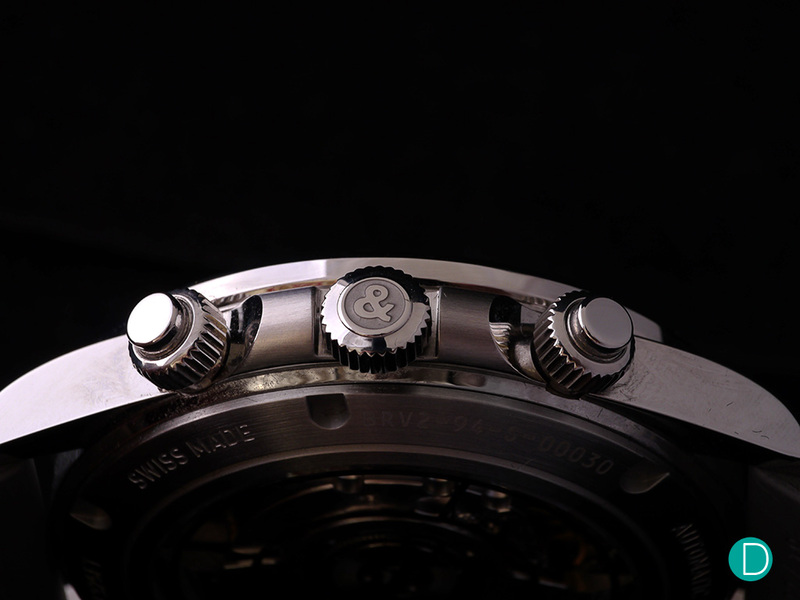 The movement features a dual register display, with a 30-min timer at 9 o’clock and a seconds subdial at 3 o’clock. Considering the entry price category of the V2-94 Garde-Côtes, the movement is a workhorse without the fanfare of finishing aesthetics or the prescribed more desirable column wheel. Some may say that the company’s strategy seems to echo trends from brands like Tag Heuer and Tudor, with its move towards vintage chronograph pieces. It is hard to escape such comparisons, considering Bell & Ross’s decision to create a more mainstream design as an extension to their signature square cases. The watch is available in bracelet and a lighter silicon strap. Overall, the watch has a well-made case construction and works great as a beater timekeeper. That said, as a matter of preference, we prefer the dial colour and overall aesthetic of its sister model, the V2-94 Belly Tanker edition over the Garde-Côtes. 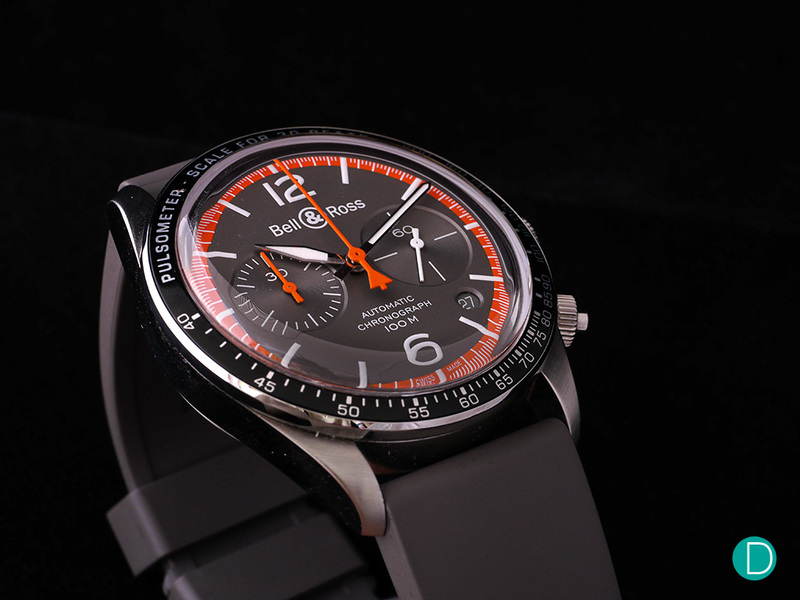 The salmon coloured dial makes for a more unique rendition of this popular chronograph design steep with competitor offerings. A palatable size on the wrist and ideal as a sports or a weekend watch. 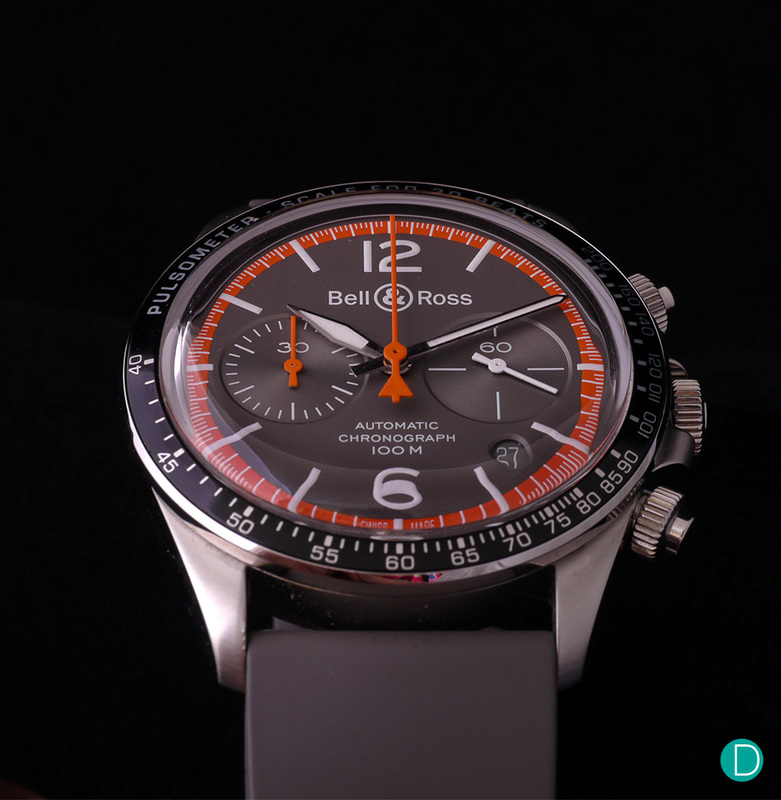 Bell & Ross’s new vintage chronograph range undoubtedly faces the challenge of making itself distinct from competitors. Long-time product icons like the Omega Speedmaster with its long history and also emerging value priced watches like the Tudor Heritage Black Bay Chrono with a more intriguing in-house chronograph movement are some such challenges Bell & Ross has to face. But the Bell & Ross V2-94 Garde-Côtes may win admirers for the good visual aesthetics and all said, it is a beautiful watch.